The Huawei Honor 7 already went through our review routine and you can learn all there is to know about the smartphone right here. Naturally we ran our battery tests to checkup its performance and we weren't disappointed. The Honor 7 relies on a 5.2" 1080p IPS display and runs on a custom Kirin 935 chipset with a powerful octa-core Cortex-A53 processor, Mali-T628 quad-core GPU and 3GB of RAM. The phone is powered by a 3,100mAh battery. The non-removable unit has the same capacity as what the Honor 6 got - a little extra juice than the P8. The Honor 7 did well on our 3G talk test lasting a notch above 14 and a half hours. While this is indeed a respectable result, it’s less than Honor 6's 17 hours score. The web browsing endurance turned out even better. The Honor 7 is capable of handling 10 and a half hours of web surfing before its battery goes flat. Another lesser score compared to Honor 6, but still a very good achievement. Such a beautiful and big display deserves a proper video playback performance and Honor 7 delivers - you can enjoy 9 and a half hours of movies before the battery drops down to the critical 10%. 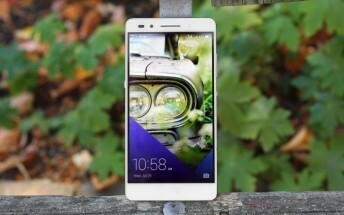 The one test where the Honor 7 beats its predecessor is standby draw. This helps the Honor 7 to achieve a 64 hours overall endurance rating - very close to the Honor 6's 67 hours mark. This means you can rely on the Honor 7 for two and a half days on a single charge, if you are to use if for an hour each of calls, web browsing and video playback daily. Oddly, the single and dual SIM standby performances turned out identical. You should keep in mind that the smartphone's brightness at the typical 50% setting was way too low and even though we set the slider to a more usable level at about 60%, the screen was still rather dim. Boosting the brightness level to usable levels is bound to lower the battery life.